Zach Brewster-Geisz as Bottom. Photo by Chris Cotterman. As a complement to their performances of Hamlet, the Bard’s greatest tragedy, the Baltimore Shakespeare Factory offers arguably his greatest comedy, A Midsummer Night’s Dream, to round out their Summer season. With its theme of couples lost in the woods (literally and emotionally), nature spirits and mayhem, it’s a perfect choice for the meadows at Evergreen. Does Shakespeare care about historical accuracy? Does he pitch his tale to fans of the Classics? Negatory: the only rule is what sells, what will get cheap laughs. What he offers instead is an eclectic mix of royalty of the real and the fairy variety, toga-clad young lovers caught up in a typical circle of love and hate, and – most improbably—a crew of clueless working class stiffs, as unlettered as they are inexperienced, trying valiantly to break into show business. The plot, so far as we can make it out, is as follows: set in Ancient Athens, we find “Duke” Theseus (he’s a King actually, but “Duke” sounds Italian and hence more hip) prepares to marry his famous Amazon sweetheart Hippolyta. Meanwhile two young men and two young women (not yet couples) take to the woods to sort out some major issues romantic and (eventually) marital. Meanwhile-meanwhile, you have fairy king Oberon and fairy queen Titania who, engaged in a typical pagan battle royal, wreak havoc on every mortal unfortunate enough to come near them. Meanwhile (cubed), you find the aspiring Peter Quince vainly trying to organize rehearsals (see “clueless working class stiffs” above) for a ‘lamentable comedy’ that he believes will vault him and his buddies to fame and fortune. If you’re confused, dear reader, consider that this just might be the point. …a perfect choice for the meadows at Evergreen. The BSF staff have once again provided audiences with ample citronella torches to keep the pesky mites away, offering us an opportunity to enjoy the action without the habitual buzz, slap and panic that distracts us this time of year. And in true Elizabethan style the cast entertains us with pleasant “unplugged” versions of contemporary hits before, during and after the show. As with their recently-concluded production of Hamlet, several actors are standouts here: Zach Brewster-Geisz is amusing as Bottom the Weaver, the would-be acting troupe’s self-appointed matinee idol; Geisz carries the show with his antics, although one wishes he could have unleashed his inner donkey a bit more. Directors Chris Cotterman and Tom Delise have also wisely double-cast Joel Ottenheimer as both Theseus and Oberon, whose authority on-stage is unquestioned whether his domain be Athens or the kingdom of the fairies. Rick Lyon-Vaiden gives a strong performance as Demetrius, the jilted suitor who becomes a plaything of the fairies once he wanders into their territory. Among the non-company players who might earn a share (or at least half a share) in the company’s future includes Laura Rocklyn, double-cast as queens Hippolyta and Titania, who gives as good as she gets. Emily Sucher is quite promising (among other roles) as Tom Snout, who has the unenviable task of playing a Wall in the aforementioned play; she provides us with some much-needed physical comedy, of which I wish there had been much more. Another worth watching for future roles is Lisa Bryan, who manages the transition from furious elder (Egeus) to hapless carpenter, utterly incapable of finding her inner lion. Jenna K, Rossman is a delight as Puck, troublesome errand-girl to the fairy king Oberon, weaving in and out of the stage and audience to make sure we are all a part of the action. 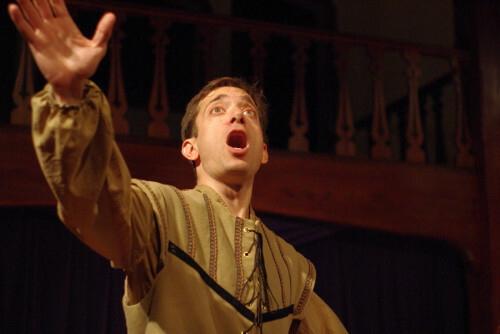 As a younger company, The Baltimore Shakespeare Factory struggles occasionally with consistency; some of the other players were not yet masters of the verse, others had not yet found their “outside voices” – critical in a venue like this one—and in future it would be a good idea for the cast to spend a lot more time developing their characters’ physicality. The comic and emotional potential of this show was lost in many points because of an all-too-conservative approach—which is a shame. Outdoor venues can be absolutely liberating for actors who have been taught, up to now, that they must be discreet and move as little as possible. With the great outdoors as their stage Cotterman would do well to let his actors loose, give them the freedom to move at will and so avoid the pitfalls of the “stand and deliver” school of verse delivery. Complaints aside I am sure the future is bright as the company continues to expand its repertoire and as it becomes more secure in its venues and funding sources. Speaking of which, The Baltimore Shakespeare Factory company has announced an ambitious fundraising campaign, with the goal of making all of their performances free to the general public by 2016. If you’ve got a spare buck or two, or (even better) a wealthy dot-com neighbor who really doesn’t need that third Beemer or that second Tesla, direct them to the website below and I am sure they will be welcomed as allies to a worthy cause. Running Time: 2 hours, 15 minutes. Performances are August 2-25, 2013 at The Meadow at Johns Hopkins University’s Evergreen Museum & Library, 4545 N. Charles, Baltimore MD. Tickets can be ordered by calling 410-921-9455, or clicking here (where you’ll also see information about their fundraising campaign. ).